Since 2016, millionaire professional football players have been sitting or taking a knee to protest racism, especially by the police. Police brutality must be a really big issue, right? Let’s have a look. The number of people killed by police in 2016 was 963. Oh, no! That sounds bad! But wait, from 2005 to April of 2017 the average number of officers arrested for on-duty murder or manslaughter was less than 7 (6.666) per year. Of those arrested, only 35% were found guilty. So, in any given year, there are 2 or 3 cases where the officer was found guilty. In a nation with a population of 327,055,027, that is not evidence of tyranny. 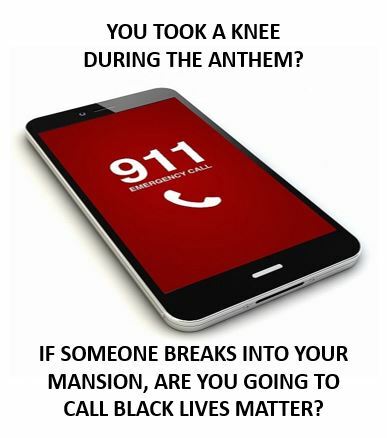 #1 Why aren’t the millionaires protesting black violence? The number of people killed by black people in 2015 was 2,934. Black criminals are more than 3 times as deadly as the mythical dangerous cops. #2 Why aren’t the millionaires protesting car crashes? The number of people killed by car crashes in 2016 was 37,461. Car crashes are more than 38 times as deadly the fantasy of cops-riding-around-killing-at-will. #3 Why aren’t the millionaires protesting Wilford Brimley’s nemesis? The number of people killed by diabetes in 2016 was 80,058. Diabetes is more than 83 times as deadly as the-sky-is-falling-police-brutality-apocalypse. #4 Why didn’t the millionaires care about alleged police brutality until an election year… were cops invented in 2016? #5 Which of those woke millionaires, politicians, media personalities, or internet experts are going to join the police force and show us all the *proper* way to police? If the numbers are correct, there may be up to 3 bad shootings from police each year…such as in 2016 when criminals killed 63 police officers by shooting them, stabbing them, beating them, or striking them with vehicles (not including accidents). 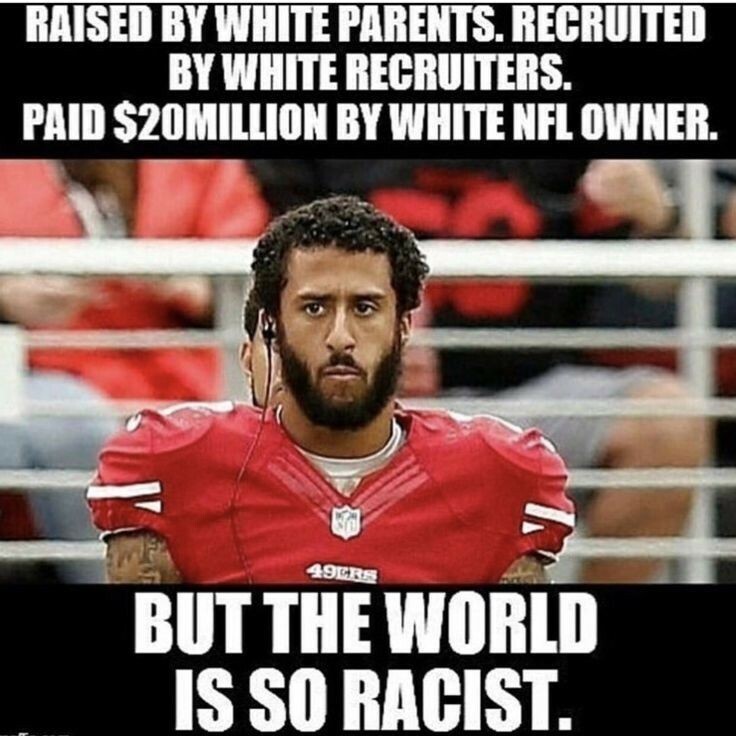 Come on, Colin Kaepernick! If you save even one of those three lives, wouldn’t it be worth it? Just ditch that cushy, multi-million-dollar income, that fame, and that media adoration and show us how it’s done! Diversity starts with you, so get woke. Great Stats Hon and on point! Unlike the idea the NFL Players, and the NFL Players Association tries present to their fans as upstanding people in a neighborhood. The Police are doing their jobs usually when someone is shot unlike the NFL Players which can’t wrap up a person for a tackle, block for a running back, come down with a ball with two hands firmly grasping it.